I have to get this one in before the Olympics are over. One of my favorite things to write about is dolls. 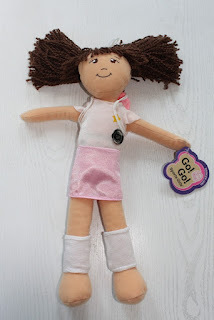 If you read this blog you know that I have written about a wide variety of dolls. If you have been watching the Olympics like me, you are in an “athletic appreciation” mood. And especially about the women. They are doing great – out medaling the men in a wide variety of sports. Doesn’t it just make it want you encourage girls to be involved in sports? Most dolls are traditional “girly” whether it be “American Girl,” “Barbie” or baby doll girly they don’t represent the active modern young girl lifestyle we’d like to encourage in girls today. At Toy Fair (Annual massive toy show in New York) I am always looking for small companies with something special to offer. 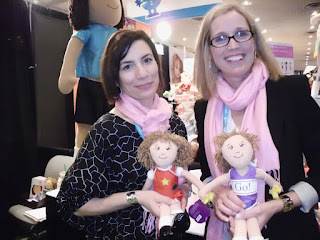 This year my favorite was Go Go Sports Girls dolls by the Dream Big Toy Company. I met Jodi Noorgaard ( pictured here on the right) who founded the company and created Go! Go! Sports Girls as a fun way to promote appreciation of healthy lifestyles among girls 3-12 years. Go! Go! Sports Girls have a child’s shape – not a woman’s shape – I love that for starters. Each doll is dressed as though she is ready to play a sport and has a tag identifying her sport including the popular Olympic sports such as gymnastics, running, swimming, basketball, tennis and more. They are made of soft cloth and are almost weightless. The dolls have a small backpack with accessories for the featured sport. A child can easily take this anywhere - no noise, lightweight and provides imaginative play. I am always attracted to companies that give back a portion of their profits. There aren’t many of them but they always seem to have developed high quality products and I like that they have made giving back part of their basic operation. 5% of profits at Dream Big Toy Company is donated to organizations that encourage girls to participate in physical activity and develop healthy lifestyles. I love these dolls. You just want to squeeze and make believe with them. And instead of imagining you are a princess, on a date, or from another time, you can imagine you are the next Serena Williams at Centre Court at Wimbledon or on the high bars in the gym. They are modestly priced and available at Amazon. You can order them from Amazon by clicking on the links below.